Donald Trump campaign chair Paul Manafort was under secret FISA warrant surveillance before and after the election, which is all kinds of bad news for Donald Trump, who was communicating with Manafort regularly throughout 2016 and 2017. As we wait to learn just how severely Trump unwittingly incriminated himself on those wiretaps, it turns out Mike Pence was caught up in the Manafort wiretap as well. After the election, Chris Christie was briefly in charge of Donald Trump’s transition team. After an internal dust-up, Christie was ousted, and the transition team was taken over by vice president-elect Mike Pence. During that transition period, it’s been confirmed that Pence and Paul Manafort communicated regularly (link). What’s vital here is that Manafort had officially left the Trump campaign months earlier, and he had no official transition role, meaning that he had no above-board reason to be regularly communicating with the head of the transition team. We still don’t know what Mike Pence and Paul Manafort were discussing during their repeated phone conversations in late 2016 and early 2017. But whatever they were talking about, Special Counsel Robert Mueller now has recordings of those conversations. 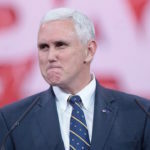 Pence has been caught lying multiple times in an effort to cover up the Trump-Russia scandal. If Pence and Manafort discussed coverup strategy during their intercepted phone calls, Pence is going down with Trump and Manafort.